A collection of 14 rarities from the modern rock superheroes, including B-sides, import-only and vinyl singles from 'Dookie', 'Insomniac', 'Nimrod' and 'Warning'. Then covers of the Ramones' like 'Outsider' & the Kinks 'Tired Of Waiting For You'. 2002. Reprise. It's Green Day. What else could you ask for? Surprise! This CD is Terrific! Ha Ha! I wasn't really expecting too much from this CD, reported to be "B-Sides" and out-takes, but it's got some awesome, memorable, and fun cuts, many of which could easily fit into "Dookie," "Nimrod," or any of Green Day's other well regarded releases. As Good as a Regular Album? YES!!! this is a wonderful CD. Everyone who says this is bad - You Lied! "Ha Ha We're Not Dead Yet!" You could fill 3 discs with the shenanigans of Green Day, and I'll admit they left a lot out on this album, but this is the ultimate prelude to the operatic, arena-rock smash hit to follow. Remember the good old punk days of Green Day with "Shenanigans". 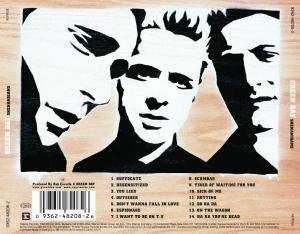 Great Green Day cd! I would rate it 4 and a half if I could. Almost five! 1. Suffocate - Great song, and great lyrics! This song's about a guy that's drunk, and he's tryig to "Get Off." 2. Desensitized - 2nd best on the whole cd! 3. You Lied - Catchy tune! After a while, it gets boring though. 4. Outsider - Cover of The Ramones. Green Day's version is way better! 5. Don't Wanna Fall in Love - Heart pounding, hed smashing song! Really fast. About a guy trying to not fall in love! 7. I Want to be on T.V. - Only a minute long. Similar to "Take Back" from Nimrod. A five star song! Rock On! 8. Scumbag - Me and all of my friends love this song! My favorite off the whole cd! On ITunes I noticed they wrote S*****g.
9. Tired of Wiating For You - Cover by the Kinks. Shows the slower side of Green Day. 10. Sick of Me (or Sick) - 5 star song! 12. Do Da Da - There's a long story on this song! While recording the "Insomniac" cd, Thsi was one of the B-Sides. The Songs "Stuck With Me" and this one were mixed up. This then became named a stupid name for a song, the present "Do Da Da." 13. On (off) the Wagon - Great song. 14. Ha Ha You're Dead - Awesome! This CD is absolutely awesome. With the exception of 1 or 2 songs this CD contains songs such as Ha Ha Your Dead and Scumbag that are just amazing. Green Day has shown yet again that they're on top of their game. This CD is probably their 2nd or 3rd best, cause I mean come on what could have beatin' Nimrod, but that's besides the point cause this is a flat out bang your head can't stop listening kinda CD. Rock on Green Day! I'm gonna rate each song 1-5, 5 being the best. 1.Suffocate:Gotta love this song, which I do, I give it 5 out of 5. 2.Desensitized:Another great song! 4 out of 5. 3.You Lied:The beat to it and the vocals are so damn catchy. 5 out of 5. 4.Outsider:If you haven't seen The New Guy, you might as well see it just for this sweet song! 5 out of 5. 5.Don't Wanna Fall in Love:Not the best song on the CD, so sorry guys, but 3 out of 5. 6.Espionage:Normally instrumentals can be a little tedious, and this one is, but in an insanely awesome way! 5 out of 5. 7.I Want to be on T.V. :Great song to rock to. 4 out of 5. 8.Scumbag:Let's go American Pie, and let's go Green Day! 5 out of 5. 9.Tired of Waiting For You:A remake, but a great one! 5 out of 5. 10.Sick of Me:Pretty good. 4 out of 5. 11.Rotting:Another fairly....AWESOME song. 4 out of 5. 12.Do Da Da:Amazing! 4 out of 5. 13.On the Wagon:Great, simply great! 4 out of 5. 14.Ha Ha You're Dead:Tops this sweet CD off with a bang! This song if either the best or 2nd best on the whole CD, way to go Green Day! 5 out of 5. Well, The album is a collection of b-sides and other songs never released - most of which were better off that way .